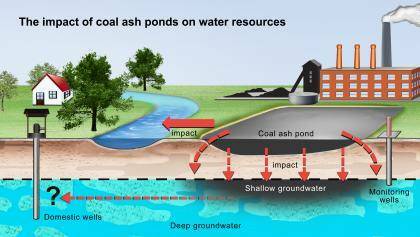 Coal ash ponds aren’t “point sources” of pollution under the Clean Water Act, even when pollutants leach from them into nearby waterways, according to a federal appeals court. At issue is a suit by the Sierra Club arguing that Dominion Energy Virginia violated the Clean Water Act when arsenic seeped into navigable waterways from a landfill and settling ponds next to a power plant in Chesapeake, Virginia. The U.S. Court of Appeals for the Fourth Circuit on Sept. 12 overturned a lower court’s ruling that Dominion violated the Clean Water Act, which, in part, regulates discharges from point sources into navigable waterbodies. Starting in 2002, Dominion started detecting arsenic in groundwater near the plant that exceeded state water quality standards. Virginia regulators in 2008 approved a utility plan to address the leaks and Dominion shuttered the plant six years later. In its suit, the Sierra Club argued the landfill and settling ponds were point sources leaking arsenic into groundwater near the power plant that ultimately flowed into the nearby Elizabeth River and Deep Creek. The appeals court, however, found the lower court erred by agreeing the landfill and ponds were point sources. “We conclude that while arsenic from the coal ash stored on Dominion’s site was found to have reached navigable waters — having been leached from the coal ash by rainwater and groundwater and ultimately carried by groundwater into navigable waters — that simple causal link does not fulfill the Clean Water Act’s requirement that the discharge be from a point source,” the court said.